The NYPD has released new footage as the search continues for a suspect who viciously assaulted a Jewish man in Flatbush on Tuesday, in what is described as an “unprovoked attack”. As reported on YWN, the man was walking down Avenue J between East 13 and East 14. Both the victim and the suspect appeared to be looking down, possibly at their phones, and accidentally bumped into each other. The suspect then directed punches and kicks at the victim, including at his head. The unidentified black man then calmly walked away. YWN has confirmed that the victim has never seen the attacker before, nor were any words exchanged prior to the assault. Nothing anti-Jewish was said before this attack. 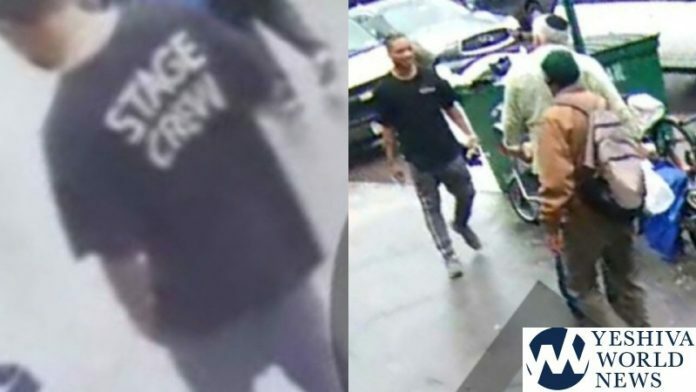 The suspect is approximately 5 foot 8, 250 pounds, was wearing a black tee shirt with the words “STAGE CREW” in white lettering on the back, and had grey pants. Police tell YWN that they are taking this isolated incident very seriously, but stress that there has not been an assault of this kind in quite some time. Police advise the community to remain calm, but to be aware of their surroundings at all time, and to report anything suspicious immediately. If you see this man, or have any information that can help police, please call 911 and then Flatbush Shomrim’s 24 hour emergency hotline at 718-338-9797.